Location: Situated overlooking Teifi on dead-end lane running S from Cwm Cou crossroads. 1920-1 Independent chapel by J. Howard Morgan of Carmarthen. 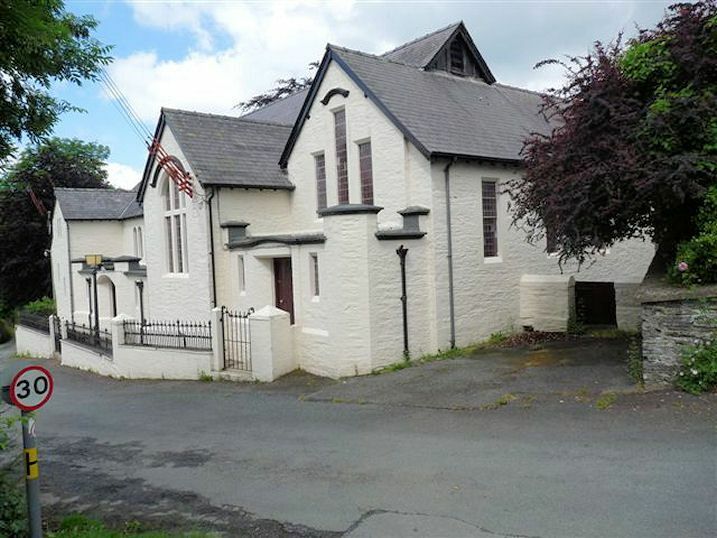 One of the older congregations in Cardiganshire, derived from a group that met in 1672 in Cenarth, the first chapel at Cwm Cou opened 1737, a branch of Llechryd chapel. The chapel was rebuilt for £400 in 1814, improved in 1843 and 1859. A photograph in the vestry shows a lateral front with arched centre windows, outer doors and 6-pane gallery lights. Whitewashed stone with cast-stone dressings and slate roofs. Unusual free style without period detail. The main chapel S side wall, parallel to road, has three pairs of plain arched small windows over ground floor porch/lobby flat-roofed projection, which is framed by two gables, smaller to left, with roof carried down lower to left, larger to right. Vestry across E end with flat roofed porch projection. Left gable has narrow centre with two rectangular stair lights, diagonally stepped, and two narrow rectangular gable lights. Set-back section to left has third, higher, stair-light and SW and NW angles chamfered in diminishing steps. Two lower diagonally-stepped stair lights in W side wall which projects slightly from main W end. W end two rectangular ground floor windows and three stepped arched gable lights. Centre porch/lobby range has cast cornice, two narrow rectangular lights each side of projecting doorway framed by two taller corniced octagonal thick piers, partly in brick, with shallow arch stretched between. Cornice stepped over 1921 date. Similar half-octagonal responds against gable walls each end. Right transept gable has big 3-light segmental arched window with flat mullions and transom and curved hoodmould over. Vestry gable set-back to right has three stepped rectangular windows with curved hood over centre light. Porch projection with slightly curved cornice, single light each side of flat-headed recessed centre door. Framing taller piers with chamfered angles and flat caps. All windows have leaded lights. Whitewashed rubble front wall with earlier C19 scrolled iron low rails, with dog-bars and urn stanchions. T-plan chapel with ornate roof: big tie-beam, queen-post and collar trusses, slatted in outer and upper triangles. W gallery with low balustrade. Similar balustrading to semicircular great seat and semi-circular pulpit, set in front of broad arch with folding high doors, to allow vestry behind to be used as stage. Pulpit front is removable. Gabled S transept and lean-to smaller N transept. Included as an unusual Arts-and-Crafts-influenced balanced asymmetrical design. A very rare example of interwar chapel design of high quality. Situated NW of mill, some 800m NE of Cwm Cou, in Ceri valley.